Lighting is not just an everyday necessity. It creates mood and style, helping your building look its best. So your buildings can always be seen in their best light, we offer a full range of lighting maintenance for all types of commercial property. 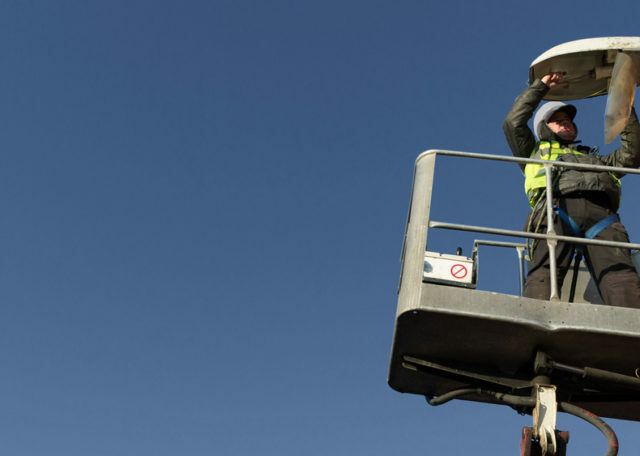 Fast and effective, our fleet of vehicle-mounted access platforms mean we’re equipped to deliver planned maintenance, emergency repairs and tailored service contracts – all while keeping down your costs. Our team of NICEIC approved technicians are IPAF qualified and trained to use a variety of access equipment to enable work to be carried out at height. Whatever your lighting needs, NSS has you well and truly covered. Working out of our nationwide depots, we provide planned maintenance contracts for properties of all shapes and sizes. Each one includes detailed service reports, method statements and risk assessments, covering all kinds of lighting. When lights fail, it can mean disruption in the workplace and expensive emergency call-outs. So why risk the lights going out when you can let our experienced team take care of everything?